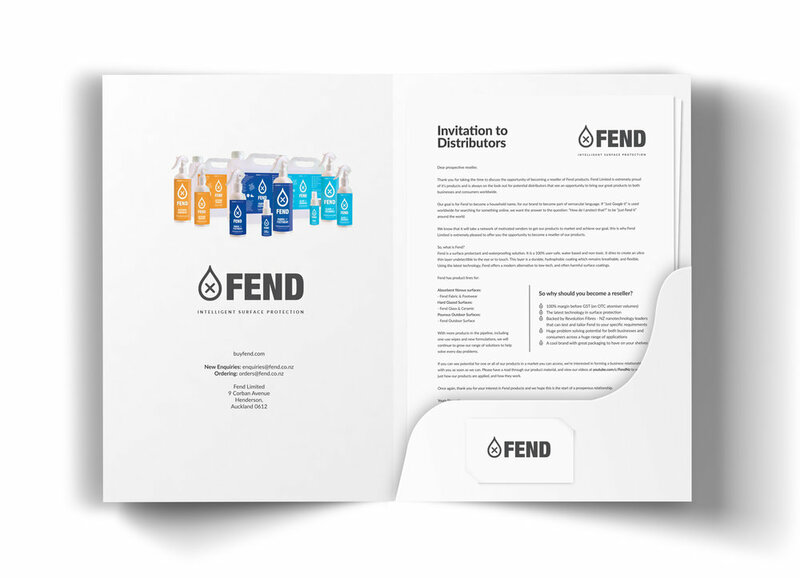 Fend is a new surface protectant product, put simply, it's liquid glass. Sio2 molecules solved in a water/ethanol mix. Once sprayed onto a surface and left to dry, it creates an ultra-thin matrix of glass around every nanoscopic fibre. Fend offers what low-tech and often harmful surface protectants cannot - change the way water behaves, without polluting it. Fend was a complete start up, just a product needing a name, an identity, and a marketable message wrapped around it. We tend to like names that describe the product or its actions while being as simple as possible. Fend immediately grabbed us as the perfect name. While still firmly in start-up mode, Fend has developed a network of retailers and Distributors in Auckland, is now sold in Australia, Canada, USA and recently the UAE.